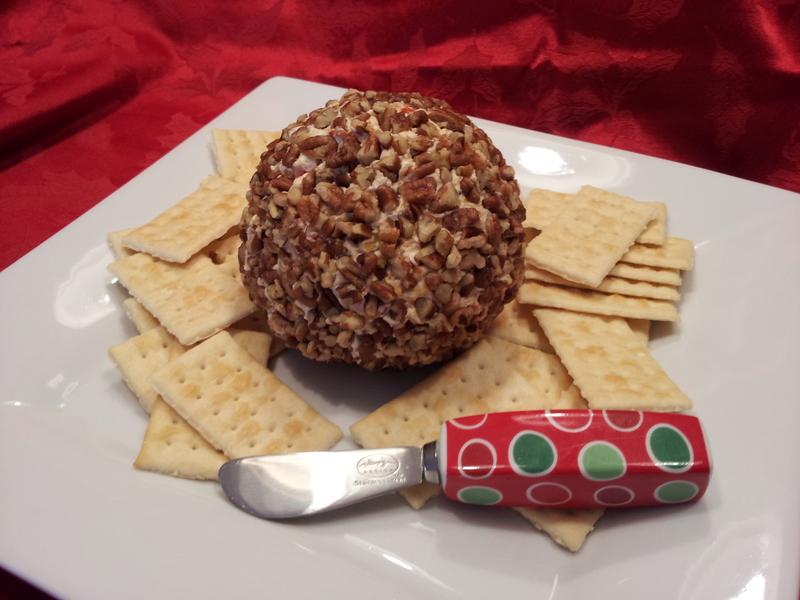 This cheese ball recipe is from an old friend and is super easy. The card in my recipe box is filled out in her handwriting. I like that — makes me think of her every time I make this special treat. It has become a favorite in our house around the holidays. You probably have most of the ingredients in your pantry. It can be made well in advance and stored in the refrigerator for a couple of weeks or for several months in the freezer. The recipe makes two cheese balls — one for yourself and one for a friend. I like to wrap it securely in saran wrap and then gift-wrap in cellophane for a festive touch. Add a cute little appetizer knife and a box of crackers and it makes a darling hostess gift. Mix the two cheeses well (clean ring-free hands work best). Add remaining ingredients and blend well. Divide into two balls and roll in chopped pecans to cover. It is better with age — so make it a few days before needed. Yum!